If you have been in financial difficulty in the past, it can be a real challenge to get your finances in order and rebuild your credit score. Unfortunately, to rebuild your credit score you need to borrow money and prove you are now better able to make those repayments and manage your money. Not only that, but there are instances in everyone's life when a loan can feel like a necessity – from paying for boiler repairs to other home improvements. By using our moneymatcher, you can very quickly begin to understand which lenders would be interested in receiving a loan application from you. Bad credit is when a lender is less likely to lend to you because of your previous borrowing history. When you apply for any kind of credit, checks are generally carried out to assess your ability to make the repayments. If you’ve previously defaulted on a loan or missed credit card payments, you may have a negative mark against your credit file. Your credit score is likely to be lower because of this. Check out our insights on understanding credit scores to find out more about how they work. In short, you will be given a credit score and the higher this is, the better chance you have of being accepted for different types of credit. This score is made up of information about your previous lending and will be used in conjunction with information you give them, such as your income, how many dependents you have and your living situation. There’s a good chance that you can still get a loan if you have bad credit. The options will be more limited, and you may have to pay higher interest rates, but there are possibilities out there. Bad credit loans are usually offered by non-traditional lenders rather than your high street bank or building society. If you pay back in full and on time, it will appear positively on your credit report. If you have no credit history, you are an unknown entity to banks and therefore they may be uncertain about lending money to you. You might hear this type of credit score being referred to as having a “thin file”. People in this situation include those just getting started in adult life. So bad credit loans are also an option for people who are in this position. The best way to begin borrowing is with smaller quantities, for example with a credit building credit card. To use this well you would borrow small sums each month and pay off in full at the end of the month to avoid any interest charges and prove you are a responsible borrower. 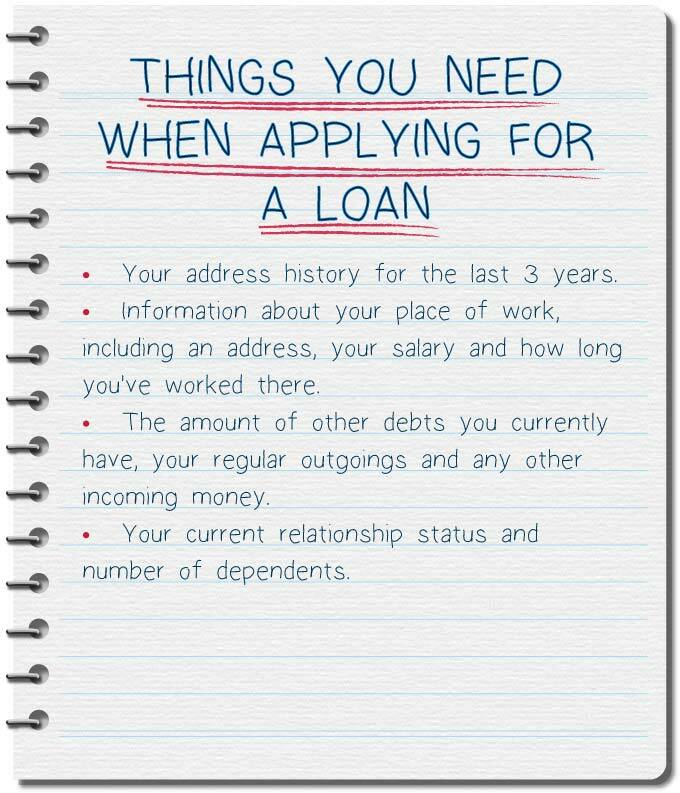 It is best not to rush a loan application as it may increase your chance of rejection, meaning you have to reapply. Multiple applications can have a negative effect on your credit standing. Therefore, do your research and be prepared. Your current and previous address. Information about your place of work, including a contact address, your salary and the amount of time spent at your current place of employment. The amount of other debts you currently have, your regular outgoings and incoming money. Information about who you live with, your current relationship status and number of dependents. Remember to always be honest on your application and to be careful filling out information. Typing mistakes such as writing the wrong home address can have an adverse effect on the application process. Too many bad points against your credit file may prevent future lenders giving you a loan. Unfortunately, there are criminal lenders out there who want to prey on those in the most need of money. These scams will often involve asking borrowers for a lending fee upfront. This could be hundreds of pounds. The supposed lender will then disappear, leaving the person in need worse off than when they started. Never pay an upfront fee for borrowing money. Make sure you are only dealing with reputable lenders by checking out independent reviews online and by checking their credentials on the Financial Services Register. To be 100% certain that a lender is genuine, use our moneymatcher. If anyone does ask for a fee up front, contact the FCA and action fraud immediately. To read more about how to protect yourself from scammers, check out our types of bad credit loans article.